What is it about baseball that keeps us all fascinated? Even though it’s slower than football and hockey. Here’s what Neil had to say about baseball his favorite sports in general. Well they sure are for me. Both passive and active. The only active sport that I am still involved in is golf. And I must admit it’s idiosyncratic golf, I only play nine holes and I don’t count. At one stroke you remove all the stress. Used to play goal for my high school hockey team but those days are long gone. But I will sure be watching the rubber game of the Stanley Cup series between Detroit and Pittsburgh. 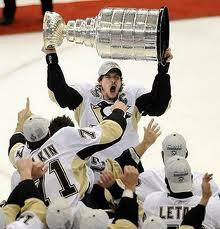 Go Crosby. I have also started watching baseball early this year. My favourite teams are the Blue Jays, the Red Sox and the Yankees in that order. I find watching baseball enormously relaxing. I know some people find it slow, about as exciting as watching paint dry. But I find it a graceful ballet between the bases, filled with strategy. Do you find sports relaxing, a good stress reliever? Do you still play any active sports? Will you be watching the Stanley Cup Final tonight? Oh, I almost forgot to mention golf and Tiger Woods. Never miss him. SHOULD CROSBY BE COMING BACK TONIGHT? After 320 days from a concussion that threatened his life, Sidney Crosby is coming back tonight for a game with the Penguins. Although his doctors have cleared Crosby, 24, to play, many people (including hockey fans) think it is too dangerous to come back now. Although concussions are down this year in the NHL, there are 19 players suffering from them. Suppose Crosby was hit again and suffered another concussion (a quite likely prospect). Would that mean lights out for good? As the Globe and Mail put in its leader this morning: “The risk of playing with a concussion is catastrophic – though rare. Second impact-syndrome (a concussion on a concussion) can cause death in young athletes. Is it worth it for Crosby to come back. He is only 24, a wealthy man and has other life options. Where do you come down when a hockey career is stacked up against a death sentence? SHOULD SIDNEY CROSBY GIVE UP ON HOCKEY? I would venture thay Sidney Crosby is one of the half dozen greatest hockey players who ever laced up skates, right up there with the likes of Wayne Gretsky and Bobby Orr. What’s more, still in his early twenties, Crosby’s greatest hockey is ahead of him. But there is an ominous cloud on Crosby’s career. Eight months ago he suffered a serious concussion. He has not played since. And further months of rehabilitation have not been effective. It now turns out that Crosby’s concussion symptoms return when he tries to operate at the 90-percent exertion level. So what happens to this super star now? He could go back to square one in his rehabilitation, hoping eventually to return to professional hockey, thereby risking another serious concussion or even death.